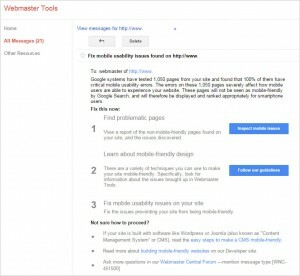 Earlier this month Google began sending warnings to webmasters with websites that don’t work well on mobile devices. Usually when Google gives a warning, something big is about to happen. In 2014 mobile overtook desktop as the most used device type to browse the web. This has led to many sites adjusting their designs to accommodate mobile devices and has also made Google want to favor mobile-friendly websites in the search results on mobile devices. In my opinion, these changes have set the web back by about two or three years. Coding techniques have allowed webmasters to push the rendering burden onto user’s machines. This ability allowed webmasters to create a much more rich experience on their websites without the need for super-servers. This ability, combined with ever-increasing internet speeds, set the web up for a very rich future. That’s been sidetracked now. Webmasters have to dumb down their sites to load as quickly as possible (because site speed is a huge factor for mobile ranking) and to fit on the screens of mobile devices. Mobile devices don’t have the screensize or the horsepower to let the web run wild. For a while we’ll see more and more sites offering somewhat diluted experiences just to be sure they are mobile friendly. It’ll take a couple years to get pointed back to a rich web. As I said before, when Google gives a warning, it’s best to pay attention. The emails are still rolling out so I don’t think any big change is closer than about three months away. Google has to allow people time to make the changes. Realistically, I think it’ll be about September before the “change”. What change? All signs point to Google demoting non-mobile friendly sites in mobile results. Google has already taken some steps to reward mobile-friendly devices through the use of a “mobile friendly” statement in mobile results. Mobile friendly sites get a reward in Google. Google Blog post about this. 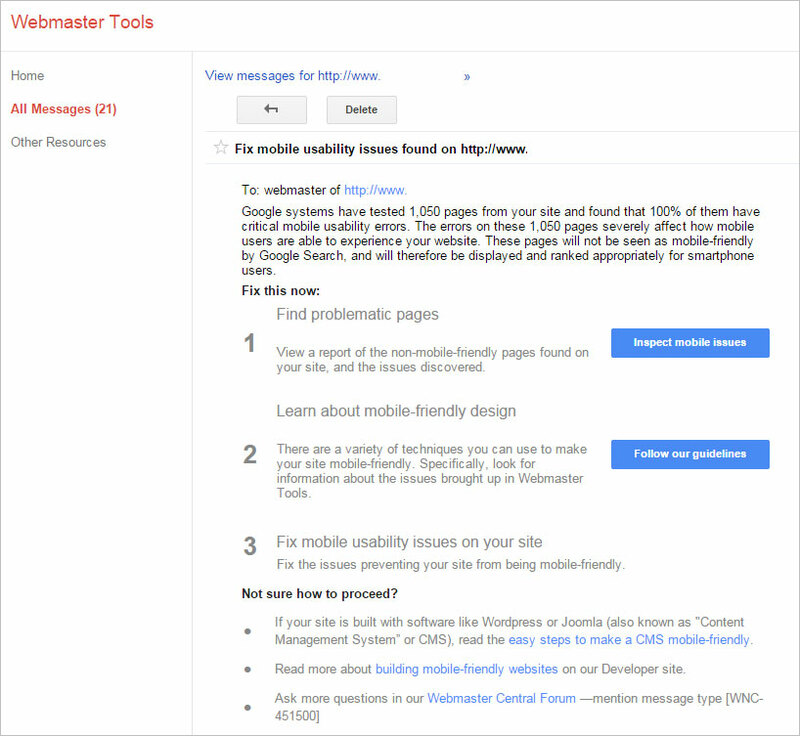 Below is a screenshot of one of the messages Google sent via Webmaster Tools. The same text is also sent out via email. Google is giving you a chance to make your site mobile friendly, and if you don’t you will inevitably pay the price. Message from Google regarding mobile usability. Click for a larger view. When you eventually bite the bullet and start the redesign / recode process, it’s in your best interest to have an SEO involved in the process. Web designers claim to know what they are doing, but every time we get a new client after a redesign, traffic is off 20%+ from before the redesign. Our clients usually come out at least even, but most of the time they start getting more traffic than they ever have before. Let us know if you need help. We’d be happy to help guide the process for your business. Check out our SEO Guidance for Site Redesign Service, or contact us today for more info.